Sketch (Artwork in PAL regions) is a multi-player minigame hosted by Orbulon in the Wii U game Game & Wario. Sketch is played by using the 's touch screen and the Stylus. The mode can be played between two to five players. At the start of the game, the players must take a picture of their faces. The order in which the players draw is decided based on who took their picture first. The objective of the minigame is for the sketcher to draw the word provided on the top of the touchscreen. If someone says the correct answers, the sketcher taps the "Correct" button and a new word is issued. The player can also delete their current drawing by tapping on the button with a garbage bin icon. Pressing the "Pass" button creates a new word, but docks 20 seconds off of the sketcher's clock, giving them less time to earn points. As the game progresses, the words become tougher to draw and multiple words may be stated. After two minutes have passed, the sketcher must give the Wii U Gamepad to the next player. After every participating player has sketched, the game ends. At the end of the minigame, the number of correct guesses from each player are added for a grand total and a grade between an A-D is issued, depending on the number of players versus the amount of correct guesses. After the numbers are totaled, a slideshow featuring all the correct guesses will be displayed and four of them will receive an "award" that is decided by Orbulon. The best drawing gets the Orbulon Award, the second place gets a Gold Award, third gets a Silver Award, fourth gets a Bronze Award, and the rest do not receive any awards. Winning pictures of the Orbulon Award can be viewed in a prize from the Cluck-a-Pop machine. 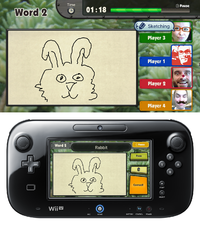 A similar minigame can be played with other users on Miiverse players in a mode called Miiverse Sketch (Miiverse Artwork in PAL regions). The player has to pick a word that is chosen randomly and try to draw it within a set amount of time. The drawing is posted on Miiverse where other drawings from the same category can be viewed as well. On November 7, 2017, the Miiverse service was discontinued, causing this minigame to no longer work. "Greetings. I am Orbulon. Your planet is full of strange things that do not exist where I come from. Please play my game and draw pictures to teach me about your world." This page was last edited on February 22, 2019, at 18:59.